As much as we like addressable LEDs for their obedience, why do we always have to control everything? At least participants of the MusicMaker Hacklab, which was part of the Artefact Festival in February this year, have learned, that sometimes we should just sit down with our electronics and listen. With the end of the Artefact Festival approaching, they still had this leftover color-changing LED from an otherwise scavenged toy reverb microphone. 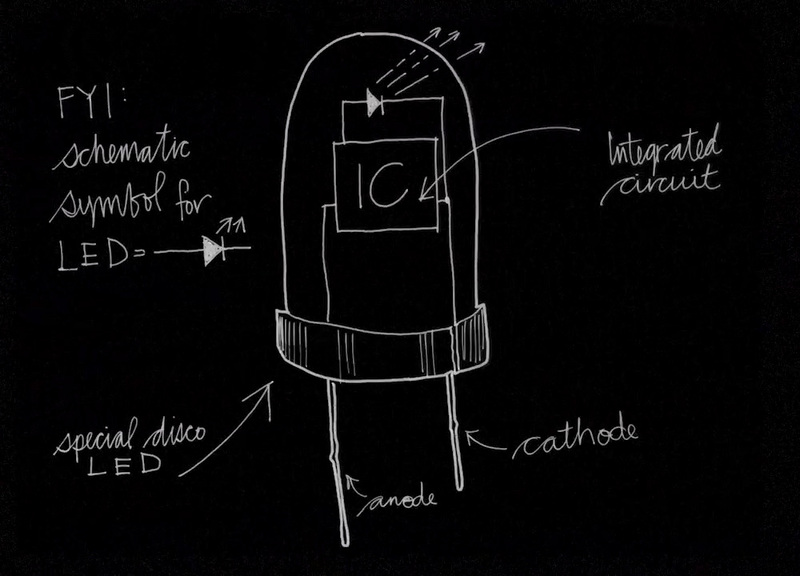 When powered by a 9 V battery, the LED would start a tiny light show, flashing, fading and mixing the very best out of its three primary colors. Acoustically, however, it spent most of its time in silent dignity. As you may know, this kind of LED contains a tiny integrated circuit. This IC pulse-width-modulates the current through the light-emitting junctions in preprogrammed patterns, thus creating the colorful light effects. 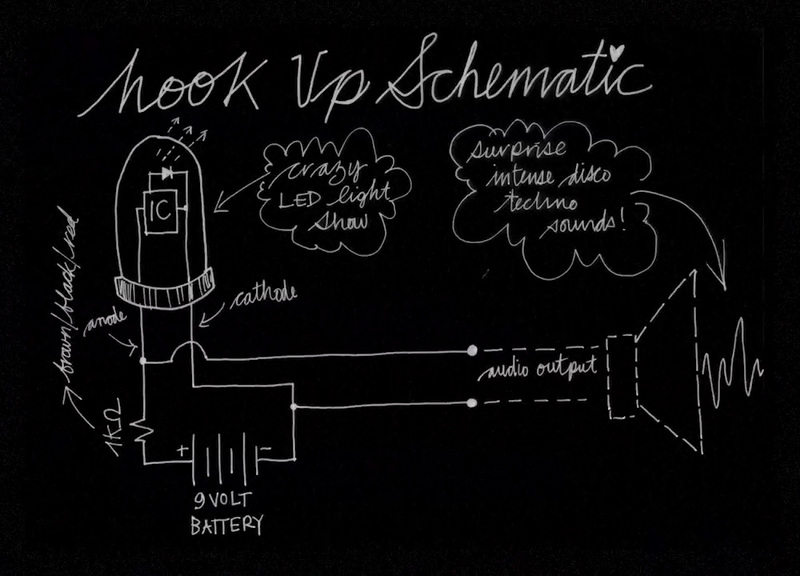 To give the LED a voice, the participants added a 1 kΩ series resistor to the LED’s “anode”, which effectively translates variations in the current passing through the LED into measurable variations of voltage. This signal could then be fed into a small speaker or a mixing console. The LED expressed its gratitude for the life-changing modification by chanting its very own disco song. This particular IC seems to operate at a switching frequency of about 1.1 kHz and the resulting square wave signal noticeably dominates the mix. However, not everything we hear there may be explained solely by the PWM. There are those rhythmic “thump” noises, shifts in pitch and amplitude of the sound and more to analyze and learn from. Not wanting to spoil your fun of making sense of the beeps and cracks (feel free to spoil as much as you want in the comments! ), we just say enjoy the video and thanks to the people of the STUK Belgium for sharing their findings. We’ve seen several creative projects from [Sprite_tm] and this one sets a new bar. He got his hands on some paint that changes color with temperature. By covering a circuit board with the paint then heating the circuits he’s created a heat actuated 7-segment display (his post is in Dutch). Three seconds at about 1 amp is enough to turn the black paint white. When the segment has been disconnected for about one minute the paint fades back to black. Now that we’ve seen his concept, leave a comment and tell us how you’d use it.